What would your favorite friendly monster look like? Use R58620 Fine Motor Skills Silly Stencils to find out! These stencils come in a variety of shapes and sizes! Perfect for budding artists to practice drawing curves and lines in all types. 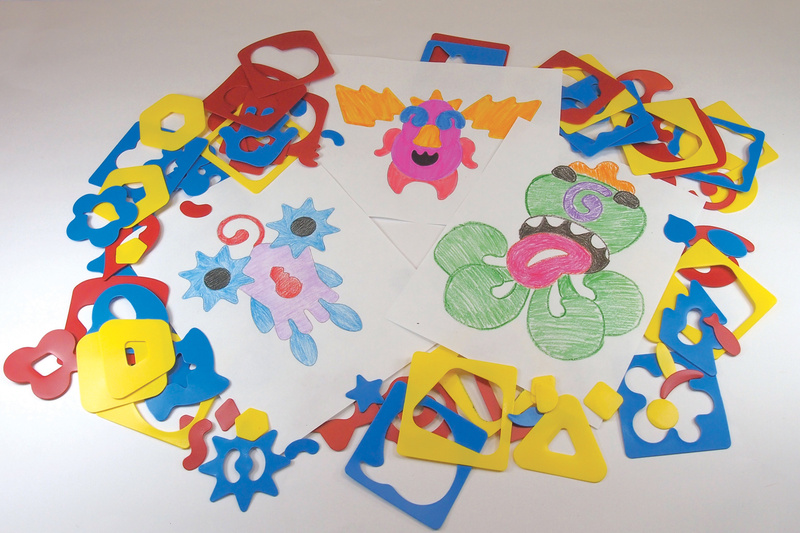 With this activity, you can combine multiple stencils to create a silly monster character. No two will turn out the same! There are three different types of stencils to choose from and all are color coded. The easiest stencils to use are colored in YELLOW. These stencils feature basic shapes with straight lines that are fun and simple to use. You can name the different shapes and experiment with tracing the stencils out onto scrap paper before beginning the project. The medium-level stencils are colored in RED. These stencils feature more curves and have more difficult shapes to trace. Some of the shapes will be familiar to students as they trace them, such as stars, hearts and clovers. The difficult stencils are colored in BLUE. These are the most challenging set of stencils and feature shapes like spirals, leaves, handprints and flowers. All the stencils feature a square border with a center shape that can be popped out and distributed to students who wish to use both the outside and inner shapes of the stencil. For the monster shapes, use one of the square border stencils and several of the smaller shapes to make the added features of each monster such as the limbs, eyes, hair, mouth, nose, wings, ears and so on. Place the starting shape in the center of your sheet of paper. This will be the monster’s body. Once you are done tracing around the shape, find some smaller stencils to add features to the body. Trace the shapes out, and erase any intersecting lines. Tip: It’s just like playing with a Mr. Potato Head®! Think of adding new features wherever possible to make your monster or alien the wackiest one ever seen! Here I’ve outlined the edges with pencil crayon and colored in the resulting spaces. Children can use markers or crayons to color in their monster too! This activity helps to build muscle strength in fingers. First children must place one hand on the stencil and secure it as they trace with the other hand. They must use their imaginations to come up with features using familiar shapes. 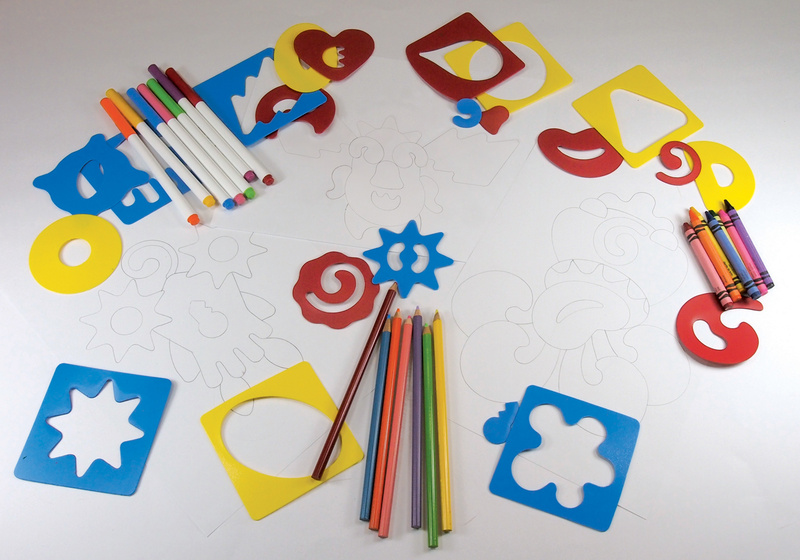 The combinations of stencils will allow children to come up with a variety of ideas for their funny friendly monsters. Later on, children can describe their monsters and write down their descriptions into their writing journals! Do you have your own silly stencil monsters you’d like to share with us? Send us photos through the contact form to have your work featured in our next post! We’d love to hear from you! This entry was posted in Art, old and tagged collage, coloring, friendly monsters, stencils, tracing by roylcoblog. Bookmark the permalink.